As I watched the snow come down and our flight time get pushed further back I kept thinking to myself: Isn’t it SPRING now? It’s sure supposed to be spring. I’m ready for spring. 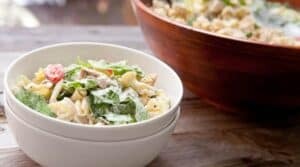 In fact, just a week ago, we had a lovely picnic in 70 degree temperatures where I made this delicious chicken caesar pasta salad! Surely I didn’t make this pasta salad during winter. Did I? But, have faith ya’ll. As the more optimistic Game of Thrones fans will say, SPRING is COMING. And when it does finally come, you should make big bowls of this pasta salad and enjoy it. Chicken Caesar Pasta Salad is the perfect recipe to feed a crowd for a picnic or it keeps great for weekday lunches! 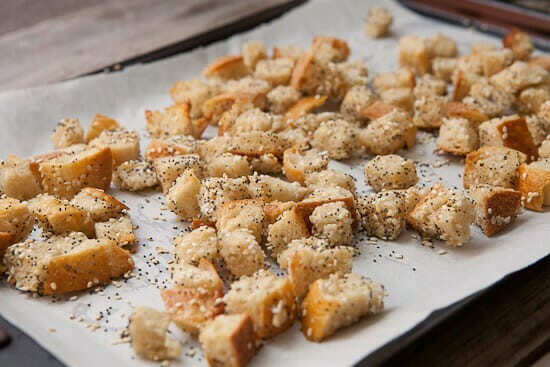 1) Prepare croutons using your favorite recipe. I prefer the everything croutons! 2) For chicken, butterfly breasts and drizzle with olive oil. 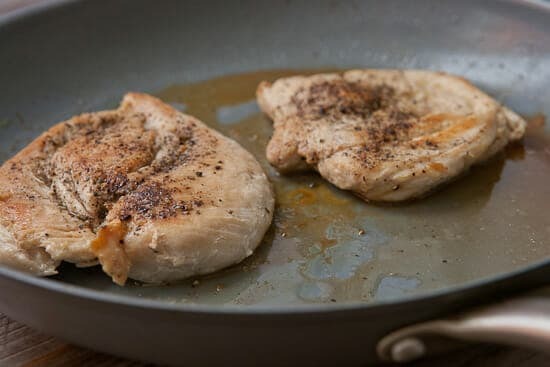 Season with salt and pepper and sear in a skillet over medium heat until cooked through (6-8 minutes per side) or you can grill the chicken until cooked through. Remove chicken and roughly chop. 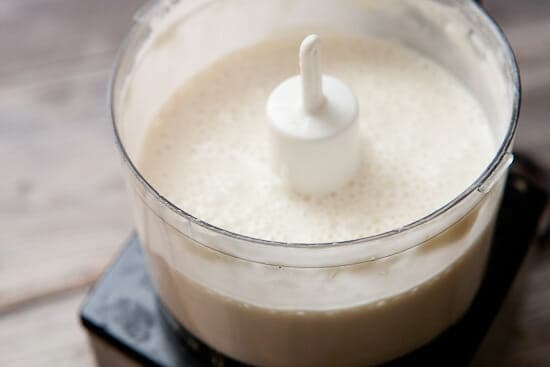 3) For dressing, add all ingredients to a mini food processor and pulse until smooth. Taste and adjust flavors to your liking. 4) Cook pasta according to package being careful not to overcook it. When done, drain and rinse with cold water to stop cooking. Then toss with a tablespoon of olive oil. 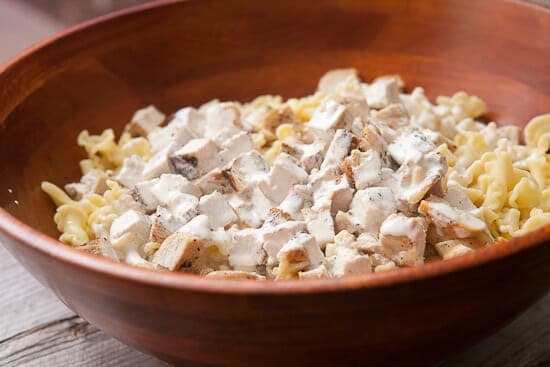 5) Add pasta to large bowl and toss with chicken and dressing. 6) Add in chopped lettuce, tomatoes, and scallions once the mixture has cooled a bit. Then add croutons and parmesan (shaved or slivered). Toss the salad together and taste for salt and pepper. Serve the salad immediately or store for up to 3-4 days. The salad is best after it sits, but add the croutons right before serving so they are crunchy! 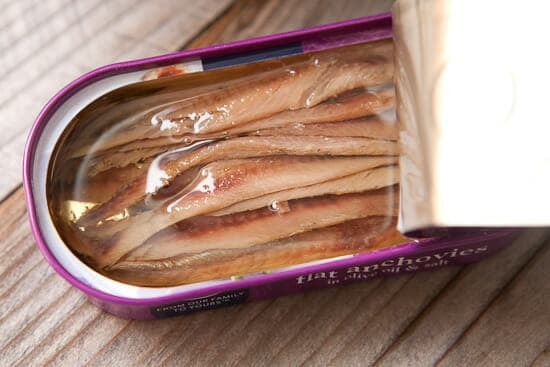 You may think that you hate anchovies, but you probably don’t. You might hate the idea of anchovies or you might hate the full form anchovy, but I promise that you don’t mind their savory deliciousness when blended into a perfect salad dressing. I only use one or two of the little fillets for a full batch of Caesar dressing, but in my opinion it just wouldn’t be Caesar dressing without them. I did lighten up this version of the dressing a bit though from what I would make for an actual salad just because I wanted it to not be too heavy on the pasta. So there is no egg and as much yogurt as mayo. Once you blend it all up though, it’s still really flavorful. I like to use interesting pastas for my pasta salads. This one is no exception. 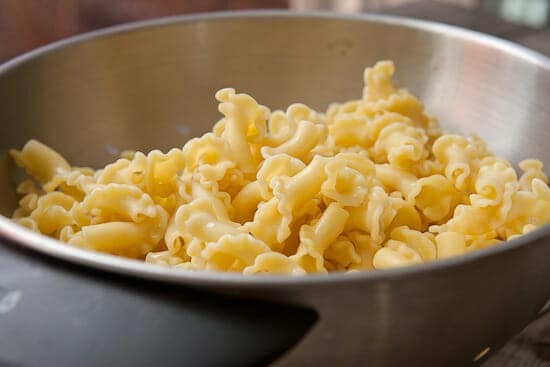 I used a fun shape called Campanelle pasta, but the truth is that you could use any shaped pasta. Penne, bowties, or shells would work great. You do want something shaped though and not in strands as that wouldn’t fold into the pasta salad as well. Also, I would use a larger pasta so it doesn’t just get soggy. Cook the pasta and then rinse it with cold water to stop the cooking and toss it with a little olive oil. Now it’s time for the chicken Caesar part of the Chicken Caesar Pasta Salad. 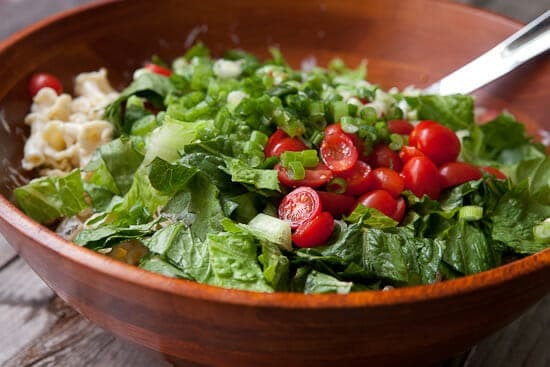 Some classic salad veggies like sturdy Romaine and grape tomatoes are a must. And, because I’m obsessed with them, I made a fresh batch of everything croutons for the pasta salad. Obviously, you could use any croutons though. For the chicken, I kept it really simple. I just butterflied open a few chicken breasts and seasoned them well with salt and pepper. Then I sauteed them in a skillet for 6-7 minutes per side until they were cooked through. You could also grill them! Whichever method you choose, there’s no harm in cutting into these to make sure they are cooked through since you are just going to chop them up anyway. Add the chicken in with the pasta and pour in all the dressing. Stir this to combine and distribute the dressing evenly. It’ll kind of soak into the pasta and chicken which is good. 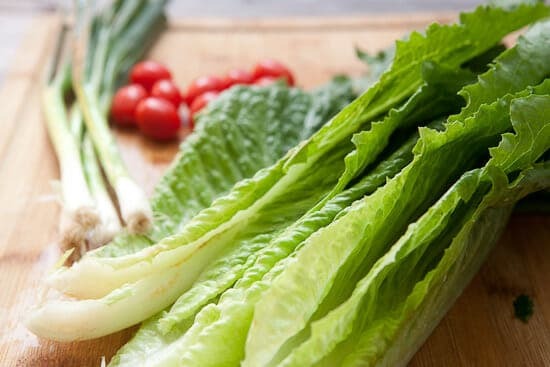 Then fold in the salad veggies: lettuce, tomatoes, and scallions. Then the flavor additions: croutons and big shreds of Parmesan cheese! You can stir this all together and then taste it for salt and pepper. It will probably be good to go though as there are lots of seasonings already working in the salad. As with any salad, this one is best if you can let it sit for a few hours before serving it. If you want to keep the croutons nice and crispy, just add them right before you serve it up! 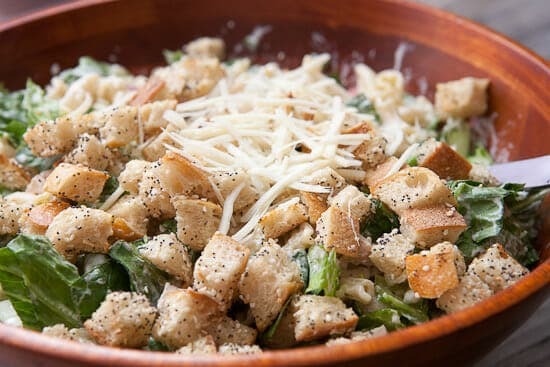 I imagine that if we all agree to make delicious chicken Caesar pasta salads this year, spring will be forced to get here. That will definitely work right? How fun and simple! Think I want to make this tonight. ALL the good things in one salad! I think this might be my go-to spring dinner calling my name. Pinning! Thanks Kate! Yea… my wife and I ate on it for a few days and were sad when it was gone. Haha nice play with the spring line. My friends are throwing a game of thrones party for the season premier. I’m super excited for spring and sunshine (more light for food photography!) This salad is a wonderful way to welcome the new season. I’d totally bring this to the beach. This looks SO delicious! I love chicken Caesar recipes!! 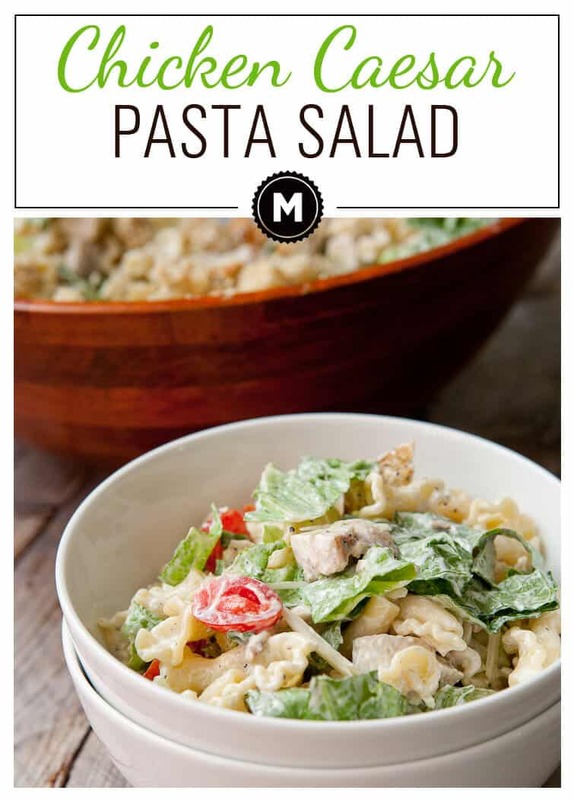 I love Caesar salad so I will definitely be trying this out– yum! So adding you to my Feedly , your recipes look amazing!